Kelly is making great progress on the Edie tee-shirt that she is making with Linen Concerto yarn she bought at Stitches West. She is also moving along on the Havannah tee that she is making with Dragon Fly Fibers Rustic Silk Dance yarn. 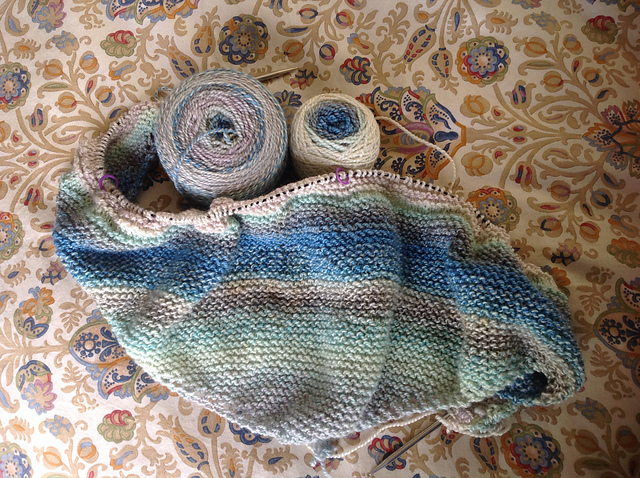 Marsha brought a shawl and her Edie tee as retreat and vacation knitting. The shawl is Among the Shadows by Kelene Kinnersly. 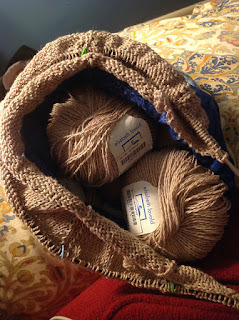 She is using a very recent purchase of Feederbrook Farm yarn that she got during her post Stitches trip to SF. First there was the wonderful weekend at NoCKRs, the Northern California Knitters Retreat, held by the Yarniacs and 2 Knit Lit Chicks podcasts. Held at the St. Francis Retreat Center, it was a relaxing and fun time catching up with friends and meeting new friends. Lots of knitting and food and drink and laughing! Then we visited Ranch of the Oaks to pick up Kelly's yarn order. On the way we had to stop at Yarns at the Adobe, the yarn shop across from the mission in San Luis Obispo. Finally, we spent the last few days of the visit dyeing the yarn that had just been milled. So much fun!